I did not enjoy an especially lavish childhood — in fact, times were downright hard in some of my early years. But the one little luxury my mother and stepfather allowed themselves was eating out at restaurants. In fact, it’d be fair to say that I grew up in restaurants. And in one restaurant in particular: The Sleepy Hollow. I can’t exactly remember where in New Jersey it stood, although Scotch Plains or Fanwood rings a bell. I am pretty sure it closed years ago, alas. But you know what it looked like. Every town had a place like this in the 1970s and early 1980s: Big, dark, wood panels, a great bar with sports always playing, a fireplace that was never lit, and a white-linen dining area where all the hoary greats of the age were served: Duchess potatoes, asparagus with hollandaise, shrimp scampi, a prime rib so good it remains the standard to which I measure all others — and, if you are feeling like a lighter dinner, chicken piccata. 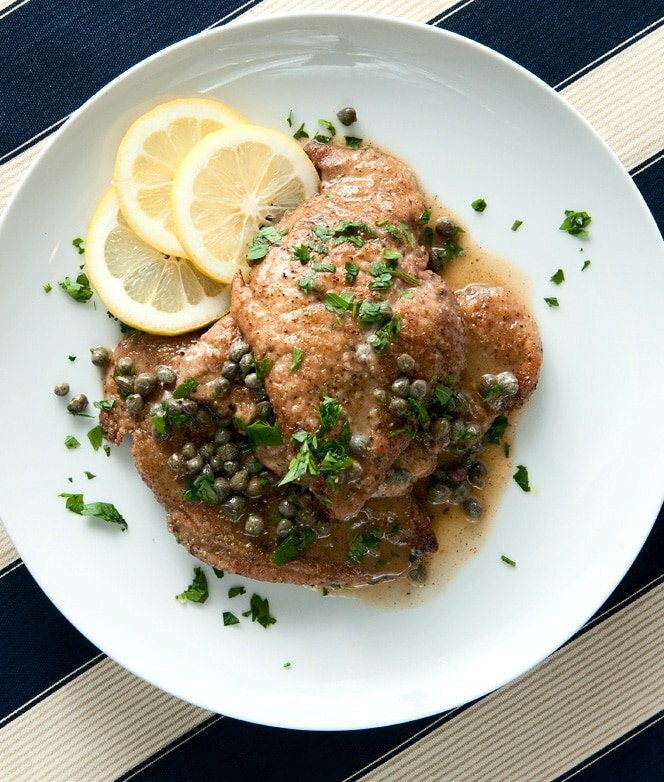 Chicken piccata is one of a triumvirate of similarly prepared classics, the others being saltimbocca and marsala. They were always either veal or chicken, and when I was not allowed to order the prime rib (it being reserved for special dinners) I would order these dishes in procession week after week. You heard right. My parents lived in that restaurant. My stepfather Frank used to hold court at the bar almost every day after work, and for a time we ate dinner there almost every night. I became an expert at whichever video game the restaurant had tucked into its one quiet corner; I remember being a god of an odd game that involved a mouse named Mappy. I loved The Hollow. Watched many a football game there; it’s where I developed my Monday Night Football habit. Grew from a boy into a man at there, actually. Hit on my first waitress at the Hollow, snuck my first drink there and grew so comfortable in the place I was practically the restaurant’s mascot. It’s probably why I became a cook, and probably why I love being in restaurants so much today. I miss it. And I miss those old dishes. They’re like that special blanket you had as a kid that mom would throw on the bed when it was extra cold. You may not cook the classics for years — decades, even — but you know that they’re in the closet of your mind, waiting to warm you when you need a little comfort. 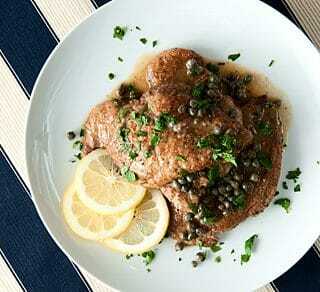 Classic piccata starts with a veal or chicken cutlet, the thinner the better, which is lightly floured (not breaded) and sauteed in olive oil and butter. You want both fats in there, not because of some smoke point issue, but for flavor. Once the cutlets are done, you add lemon juice and white wine to the pan, deglaze it, add capers, boil it down, turn off the heat and swirl in some more butter. Garnish with parsley. Curly parsley, if you want to be very 1978. Piccata is a very easy dish to make, except for one point: To make the sauce properly, it must be finished with sweet (unsalted) butter off the heat. Skip this and the sauce will break. Have everything ready to go before you start cooking because this dish comes together quickly. Chicken and veal cutlets are classic here, but I use pounded pheasant breasts. Slices of a turkey breast would be good here, too, as would a cutlet made from wild boar or bear loin. You could also do it with grouse or partridge breasts. Put each breast between two sheets of plastic wrap and pound them flat with a rubber mallet, empty wine bottle or meat mallet. You want them about 1/4 inch thin if you can. Better to err on being too thick than thin. Salt and pepper the cutlets well and dust with the flour. White flour is traditional here, but I like to pair darker flours with game, so I use whole wheat, rye or spelt flour. Get the oil and 2 tablespoons of butter hot over medium high heat, and saute to the floured breasts for 3 minutes on one side, 2 minutes on the other. You may need to do this in batches. Move to a plate and tent with foil. Pour in the lemon juice and white wine and scrape any brown bits off the bottom of the pan with a wooden spoon. Add the capers and boil this down by half over high heat, maybe 2 minutes. Turn off the heat and put the pheasant breasts on serving plates. Put the remaining butter in the saute pan and swirl it around until it melts. The sauce should be emulsified and smooth. Pour over the pheasant and garnish with the parsley. I really enjoyed the walk down memory lane with you, especially the Prime Rib. The 70’s really had their share of great prime rib places on the west coast too. Off course, sorry. Love the pheasant recipe, as well. Will try it for sure. In fact, all the recipes that I read sound scrumptious and the pics are great. Thank you so much for sharing! 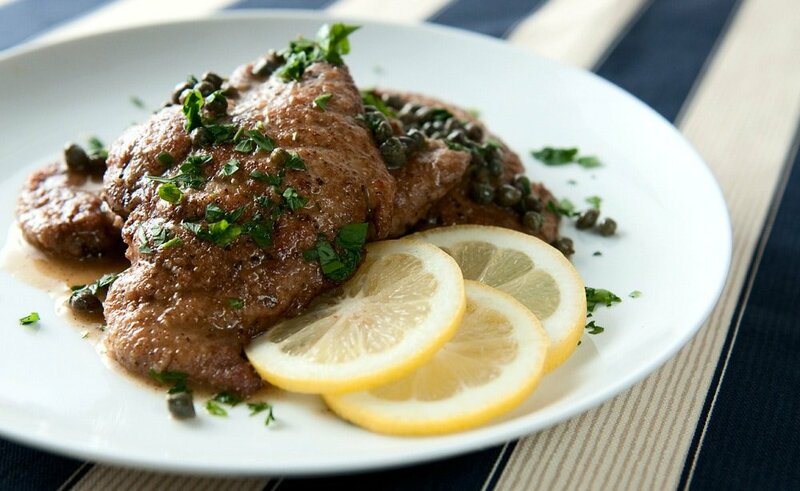 I love Chicken Piccata and the recipe looks amazing. One drawback, I hate capers! I first had this dish in upstate NY and I don’t remember them having capers in it. Do you have to have capers? Is there a paste I can use instead? I’m not a pea person either so you can see where this is coming from. I would really appreciate your opinion for I’d love to have this dish again. Just skip the capers – it won’t be authentic, but it will still taste just fine. I love piccata, its a standard for me and so simple. I’d imagine wild boar would be wonderful with this recipe, as I frequently use the thin cut pork lions you find at markets in place of chicken. Given the superior taste of wild pig, it will probably be even more tasty than standard recipes. Another alternative I’ve used is fresh albacore loin; its meaty texture does well, and its not unlike chicken or upland game birds. I done this with bluefin too, but….its rare I get a chance to bring home really fresh bluefin from the SoCal grounds, so I feel they deserve something a little more complicated.